Sometimes you want need chocolate for breakfast. Sometimes it’s a perfect pair with your third cup of coffee. Sometimes it’s just what you needed to make a gloomy morning seem brighter. 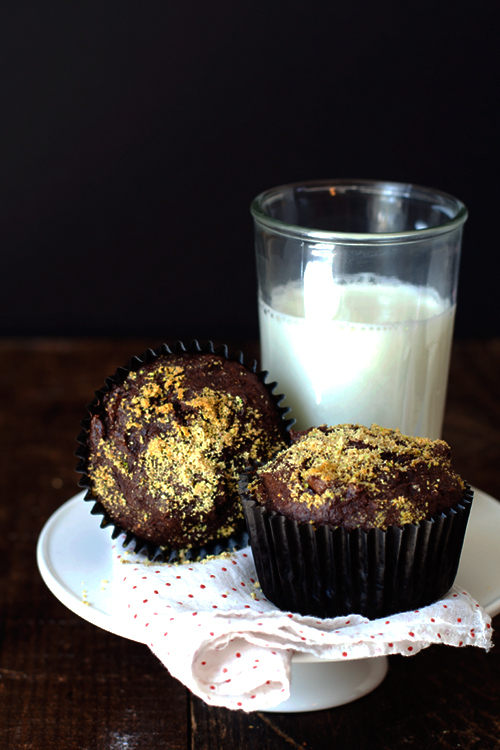 Chocolate muffins always make me happy–it’s like dessert for breakfast without actually being dessert. 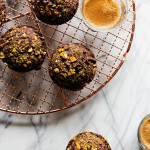 These muffins keep it real with healthful yogurt, a touch of olive oil, some nutty wheat germ, a bit of cocoa, some nuts for crunch, and a handful of chocolate chips for good measure. They aren’t too sweet, so go ahead and smear some berry jam on there. Or, if you want need to, a smear of nutella or cookie butter would be amazing–I totes won’t judge. Oh yum. I love chocolate all the time! I need these today, and man-0-man, there’s crunchy cookie butter now… I need to get that and make these and drink champagne with my dessert-fast. 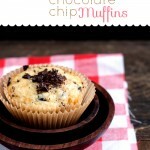 I am definitely a chocolate for breakfast kind of girl – these muffins look right up my street! Ooooh yes. Pistachios are such an underrated cookie/muffin/cake add-in. 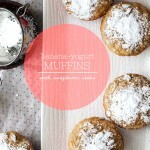 These muffins, with a schmear of nutella or cookie butter? I DIE. So yummy! They’re so dark and chocolaty looking, I would love to munch on one of these at my desk right now! I love the contrast of the nuts and the dark chocolate color! And you are my hero for developing a chocolate muffin recipe that is healthy-ish. ;) Rock on. Oh man, I could use of these for breakfast, lunch and dinner! The chopped pistachios are so dang pretty on top. Delicious. And chocolate for breakfast is just another one of the perks of being an adult. Looks really good! I would so love to try some. I am sure it tastes amazing. 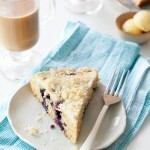 I’m totes going to eat one of these every morning for the rest of my life. The other night I made the banana muffins you posted a while ago and I may or may not have eaten most of them. 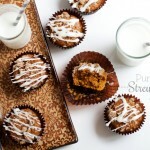 I’m sure I would do the same with these, a chocolate muffin diet sounds pretty awesome. So true, Cindy – sometimes you do need chocolate for breakfast. I finally got to try this cookie butter that everyone’s always raving about while I was in the U.S. last month, and I’m in love! It would definitely be amazing on these muffins. cookie butter is just danger! thanks Jess! A chocolate muffin with berry jam would TOTALLY hit the spot right now. I’ll have to wait another week until I’m done with this silly self-imposed cleanse thing before I dig in. In moderation, of course. way to be with that cleanse! mmmm! breakfast calls! 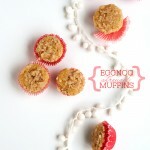 and I would totally do these with hazelnuts, too. don’t you think? Ooooh, girl– you had me at the combination of chocolate and pistachios. And then you go ahead and tell me that they’re okay to eat for breakfast? Well now, I think that just makes this the best day ever. I think I need chocolate at every meal. 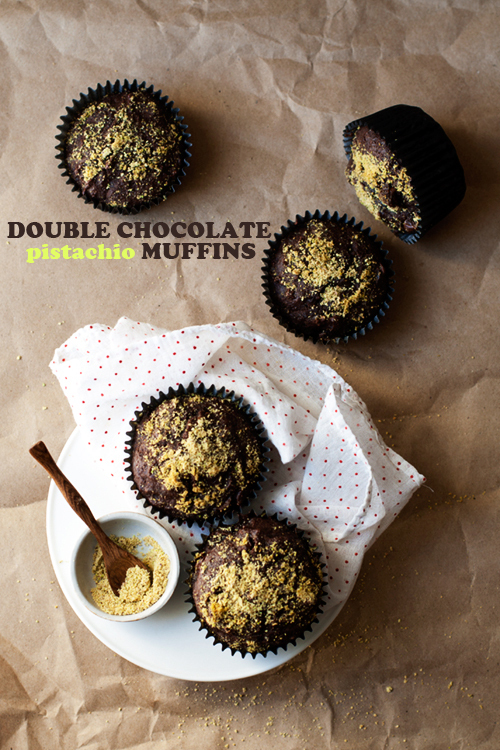 And I love chocolate + olive oil (health food in my mind) so I definitely need these muffins.